Home Meditation	What exactly are the Chakras ? What exactly are the Chakras ? In ancient times the Chakras were only known to a select few initiates within the mystery schools of the East. These initiates would study arcane manuscripts with the hopes of unlocking the power and secrets of the Chakras. Many of these manuscripts such as The Yoga Sutras of Patanjali, The Siva Samhita and The Hatha Yoga of Pradipika were once secreted within in temples hidden away from the eyes of the profane. Today Chakras are not so hidden and the knowledge of them is not secreted within temples. But the perceptions of Chakras has changed drastically in modern times, to be more of a fleeting ever-changing mythology, a religion of sorts encircled by new age ignorance. But in ancient times to release the power of the Chakras one needed an unwavering dedication, the most serious of minds and the development of one-pointed focus. In those times the mastery of the Chakras lead not only to rejuvenation of body and mind, but also revealed the secrets of life and creation itself. According to certain manuscripts mastery of the Chakras bestowed superhuman mental and physical abilities. So what exactly are the Chakras? The Chakras are pools of concentrated spiraling energy within the body, the word Chakra (चक्र) derives from the Sanskrit word meaning “wheel,” as well as “circle”. The Chakras are symbolically represented as lotus flowers of varying colors, each Chakra color is said to radiate a different sound frequency, oscillating from low to high beginning at the Muladhara Chakra. These frequencies are called seed sounds and are said to be emitted from the center of each Chakra. 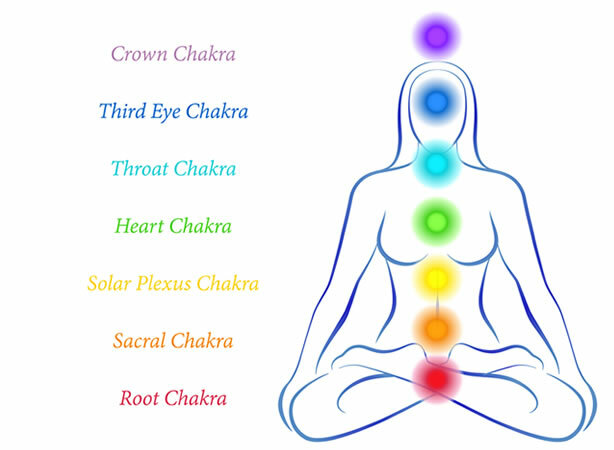 The body is known to have seven major Chakras and many minor ones according to Hinduism, Buddhism, and Jainism. Each Chakra is connected to multiple subtle energy channels called nadis, which are in turn connected to different parts of the multi-dimensional body. The nadis carry prana to different parts of the body much like veins carry blood in the body. Where are the Chakras located and what are their properties? 1. Muladhara is the First Chakra – it’s a red Chakra with four petals. Its element is earth and its Seed sound is LAM. The physical world and the lower extremities of the body are associated with this Chakra Location: located at the perineum, base of your spine. 6. Ajna is the Sixth Chakra – It’s an indigo Chakra and has two petals. The Pranava or OM is its seed sound. This chakra associated with the eyes, the pineal gland, and the higher self. Location: at the center of your forehead between the eyebrows. 7. Sahasrara is the Seventh chakra – this Chakra possesses all colors and has a thousand petals. This Chakra has no seed sound but encompasses all sounds. It represents a state of Samadhi in being one with the universe, total cooperation between the self and the higher self. This Chakra is associated with the brain and the pituitary gland. Location: at the top of the head. What kind of powers and knowledge do the Chakras bestow? According to the Siva Samhita the benefits of mastering the meditation by way of visualization on the Chakras bestows intriguing, somewhat unbelievable benefits. Meditation on the Muladhara Chakra : brings brilliance to the body, frog-like jumping ability, improves digestion, freedom from disease and the mind becomes sharp. Meditation on the Swahisthana Chakra : attains psychic powers, prana starts to move equally throughout the body. Meditation on the Manipura Chakra : attains all desires, the physical body becomes deathless and one develops the power to enter another’s body. Meditation on the Anahata Chakra : one attains all things seen and unseen, one has access to all knowledge of the past present and future, one can levitate. Meditation on the Vishuddha Chakra : one knows all of the mysteries of the four Vedas. Meditation on the Ajna Chakra : one attains all of the boons of the previous Chakras. I didn’t mention the Sahasra Chakra because there is no meditation instruction to do so. The manuscripts state that once the previous 6 Chakras are open and functioning optimally that the Sahasra Chakra opens to the higher self, the Paramatma which is the source of all things. Learn how to Unblock the Chakras here! B12 the lost key of maintaining energy and youth. How to cure Cancer naturally! How Donald Trump will save America! You’ve got me wanting to learn more, and practice. Great blog! I like the tips about meditating to gain certain attributes. After reading this, it makes me wonder if Americans have turned a deeply spiritual commitment into athleticism disguised as “seeking enlightenment”. Refreshing perspective, for sure. I would be happy to include a link to your blog as part of my listing as well, this is a very well-written article and I think it would benefit anyone exploring. Thank you!